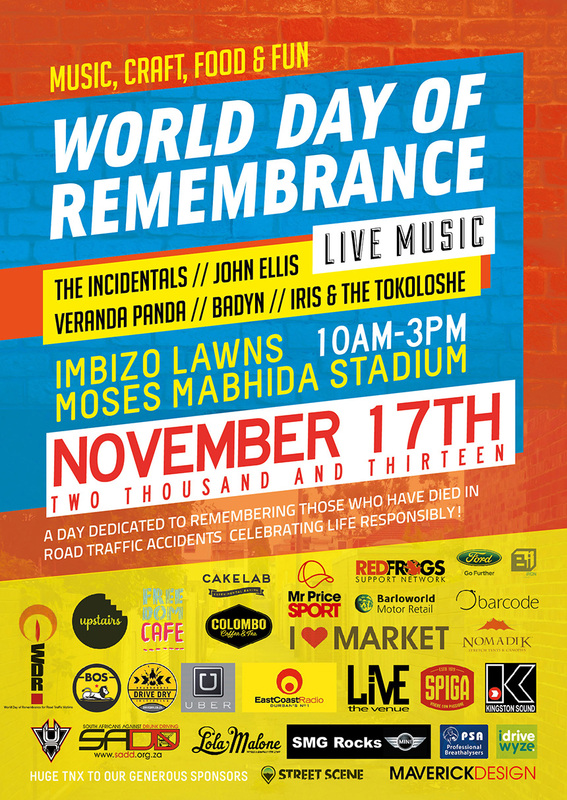 The World Day of Remembrance is an international initiative that takes place on the third Sunday of November. It is the day on which all those killed and injured in road crashes around the world are remembered. Their families, the emergency services and all others affected by traffic accidents gather to unite, pay tribute and celebrate life. You can find out more about this worldwide initiative here. This year, in collaboration with East Coast Radio, Spiga Italian Restaurant, I Heart Market, Kingston Sound, Live the Venue, Moses Mabhiba Stadium, People’s Park Café, Bos Ice Tea and South African’s Against Drunken Driving we are hosting a vibrant social day out for the whole family. Situated on the grassy Imbizo Lawns of Moses Mabhida Stadium (opposite Nino’s), will be an I Heart Market marquee filled with locally designed crafts, fashion and jewellery, a Bos Ice Tea acoustic music stage hosting John Ellis, Veranda Panda, The Incidentals, Badyn, and Iris and the Tokoloshe. A remembrance area hosting a selected panel of local businesses will be centrally situated to create awareness by informing the public on the dangers of drinking and driving and general road safety. A public art installation, the Before I Die project, will also allow families and friends to remember their loved ones. This free day festival is going to be an event attracting the perfect blend of Durbanites, featuring local crafters, Durban musicians, artists, kiddies entertainment, food and fun. Bring your friends and family down to Moses Mabhida Stadium! Visit the World Day of Remembrance – Durban Facebook page, the Event page, or see what’s happening on Twitter or Instagram with #rememberme .